Pastor Tom Baker of the Law and Gospel broadcast on KFUO radio tells a story of a woman terrified because she cannot forgive another person. The person in question, while intoxicated, killed her husband in a car crash. He was convicted and sent to jail and she is left with no husband and lots of anger toward this careless individual. She heard a sermon on the above text and it was handled very poorly. The sermon ended on an all law stance and she was left with the guilt. That would be understandable if one were to in pride declare oneself to be more holy than the other person as in the parable and refuse to forgive. In sinful arrogance spit at the law of God in order to carry a grudge and exact revenge. However, this was not the frame of mind for this dear sister. She was heartbroken at the loss of her longtime spouse as anyone should be. She told Pastor Baker that she cannot forgive. He told her she did not HAVE to forgive in order to be saved. What! Does that not contradict the words of Jesus. No because the Gospel is not to be mingled with law. The Gospel carries no requirements. The good news is that Jesus did it all for us. But how are we to read the words of Jesus in this case and not see how we fall into the wicked servant’s position? Yes that is the purpose of this teaching. To kill us so we do not rely on our abilities to even forgive others. Jesus of course took care of that while on earth. While dying on the cross for the sin of the world He forgave those who were torturing Him and jeering at Him. Our full sufficiency is in Jesus. Even while being crucified He pleased His Father for us sinners. How glorious and comforting to know His righteousness is ours by faith. We are set free to forgive others and not have to be concerned whether it is good enough. "Truly, truly, I say to you, if you shall ask the Father for anything, He will give it to you in My name. Until now you have asked for nothing in My name; ask, and you will receive, that your joy may be made full. These things I have spoken to you in figurative language; an hour is coming when I will speak no more to you in figurative language, but will tell you plainly of the Father. In that day you will ask in My name, and I do not say to you that I will request the Father on your behalf; for the Father Himself loves you, because you have loved Me, and have believed that I came forth from the Father. 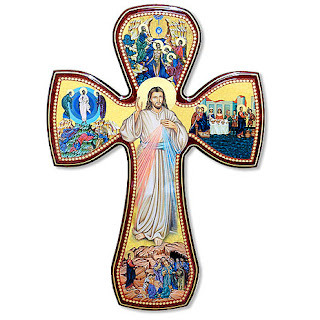 I came forth from the Father, and have come into the world; I am leaving the world again, and going to the Father." His disciples said, "Lo, now You are speaking plainly, and are not using a figure of speech. Now we know that You know all things, and have no need for anyone to question You; by this we believe that You came from God." Most Sundays of the Church Year get their names from the opening lines of the Introit — Cantate means "0 Sing", Quasimodogeniti means "Like new-born babes", Jubilate means "Rejoice!" Or they get their names from their proximity to a significant Sunday or a holiday - The Sundays after Easter, the Sundays after Epiphany, the Sundays after Trinity. I am not aware of any other Sunday of the Church Year (except holidays, of course) that gets its name from the theme of the day. Rogate Sunday is the only one. Rogate comes from the Latin word meaning "to ask" or "to question". Not so literally, it means "to pray." In other words, Rogate Sunday is the Sunday of Prayer. It gets its name from the ancient custom of the days of Rogation, the three days before the Ascension. Rogate Sunday, however, is not part of the days of rogation, and because of the lessons for the day, it has become the Festival of Prayer. In our Gospel, Jesus promises an answer to every prayer, so our theme, this morning, is what the text finally says to us - Therefore, pray! The words of our text are part of the discourse of Jesus on Maundy Thursday, before He went out to the Garden to pray and to be betrayed. After the Supper, and after Judas had fled to do His dirty work, Jesus had a sort of farewell speech — they call such things "farewell discourses" — and then He prayed all of John, chapter seventeen (called Jesus' High Priestly Prayer), and then they went out to the Garden of Gethsemane. Our text comes just two verse before His prayer. In our text, Jesus tells His disciples to start praying in His name, and promises that God the Father will hear and answer their prayers. Remember that Jesus was speaking to His disciples. We are also recipients of the promises, but we were not the original audience. Those disciples were accustomed to Jesus, in the flesh. This text comes in the middle of Jesus warning them that He was going away, and they would not see Him, and their hearts would know sorrow on account of that. These disciples were accustomed to asking things of their Master - and receiving something in response. They were not accustomed to asking for motorized toys, or even candy bars, but when they asked Jesus a question, He answered. When they wanted to eat, they got to eat - now and again they ate miraculously. Jesus was telling them that when He was gone from among them, they were going to have the same relationship with the Father that they had with Jesus. They would not be praying to Jesus, but to God, and He would deal with them just as they might expect Jesus would. He would answer. Whatever it was that they needed, God the Father would provide. Jesus even made the point that He wasn't going to have to intercede with the Father for them, in order to get what they needed, but the Father Himself would listen and answer their prayers because He loved them! These words are not unique, nor is the lesson about prayer unique to this spot in Scriptures or to this time in the ministry of Jesus. It is significant here because Jesus is about to die - and He wants them to be thinking about prayer and remembering prayer in the coming distresses. And it is sort of unique - Jesus tells them here to get with it and start praying. "Up 'til now you have asked for nothing in My name; ask, and you will receive, that your joy may be made full." Jesus reminds the disciples that even though He has taught about prayer, they haven't used it much. That makes sense, when you think about it. Jesus was there. He provided. He prayed on their behalf. He was their supply - so why would they need to go anywhere else? They had no real reasons for prayer. Even in the gravest of dangers, Jesus could handle things. He calmed storms, and fed thousands. He healed the sick and raised the dead. While Jesus was with them, they did not see their need to pray to God the Father. They had the Son. But now Jesus was about to go away from them. They weren't understanding that too well, but Jesus knew that they would need to know what He was telling them, and very soon. So, Jesus tells them to start praying — and promises them that God will listen and answer — ask, and you will receive. That promise is for you, too. And, you can pray about anything. There are times in our lives when things go so well we might forget to pray. Or perhaps we remember to pray, but we pray about really "spiritual̓ things because life is going okay. You can pray. You need to pray - and not just pious little phrases, but heartfelt cries to God about life and about sin and about all of the things that matter to you, even if they are going just fine for the moment. But let's face it, things almost never go that well, and certainly not for that long, in this world of sin and tears. For those times when things aren't going well, God has given you the divine right of prayer. You have been free to pray all of your life, so perhaps you don't understand how big a deal this is. In ancient times, when you approached a king, you could not speak unless you were granted the right. If you spoke out of turn, it could cost you your life. The important people of the world granted an audience - you didn't have the right to just walk up and start talking to them. So how much more for God?! Even in the Old Testament times, the priests interceded for the people - the right to talk directly to God and expect anything in the way of an answer was not a common privilege. You asked a priest to talk to God about it for you, and then you made the proper sacrifice! But now, Jesus gives us the right to just walk up to God, so to speak, and talk to Him! And He promises that God will listen to you and answer you. He has promised to hear all of our prayers for Jesus sake. Therefore, Pray! The door is open because Jesus died for you, taking your sin from between you and God and opening up the channels of love and blessings and communication. The cross is the sign that God loves you, and the empty tomb of Easter is your assurance that God will hear you and answer every prayer, and bless you. That is what praying in Jesus' name means. It is a result of the Gospel. By raising Jesus from the dead, God declared that what Jesus had done was sufficient, and more, and now nothing stands between the believer and God, so you pray. Jesus tried to make that point with the disciples, in fact. 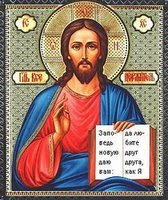 He said, In that day you will ask in My name, and I do not say to you that I will request the Father on your behalf; for the Father Himself loves you1 because you have loved Me, and have believed that I came forth from the Father. We pray in the name of Jesus. That means that we understand that our fitness to come before the heavenly Father is on account of Jesus - or because of what He has done. We have been given the right of prayer because Jesus died for us. God will hear us because our sins no longer stand in the way. God will answer for the sake of the suffering and death of His own Son. That is at least part of what we mean when we say that we pray in the name of Jesus. It isn't just saying the words, "and this I pray in Jesus' name", as though they were some sort of magic incantation. No, prayer in the name of Jesus is acting on faith, specifically acting on our faith, and the doctrine of our faith — which is to say on the truth of our faith. But then, Jesus tells us that God doesn't respond just because of what Jesus did, but because of His great love for us. Jesus doesn't have to intercept our prayers and bring them to His Father, acting as the mediator for the petitioner. The Father listens to our prayers, and He answers them because He loves us — and He loves us in particular because we have believed in Jesus. Now, I imagine that this all might sound confusing. First, it is in the name of Jesus, but then, it is because God the Father loves us, and then, He loves us because we believe in Jesus. Yes, it can be confusing — but only if we try to make God think like us. We pray because Jesus has opened the door. Our right to pray is through Him, and He has taken our sin out of the way - Luther said it well in the Small Catechism, when He wrote the "What does this mean?" to the Fifth Petition, We pray in this petition that our Father in heaven would not look upon our sins, nor on their account deny our prayer; for we are worthy of none of the things for which we pray, neither have we deserved them; but that He would grant them all to us by grace, for we daily sin much and indeed deserve nothing but punishment. Then, Jesus says that the Father loves you. The love of the Father was the cause of the works of Christ on your behalf. Having made us His Children and redeemed us and rescued us from sin, death and hell, God loves us all the more. So, Jesus doesn't have to be our Mediator in prayer, because God loves us, and wants to be in communion with His children who believe in Him through Jesus Christ. In practical terms, that means that when you pray in times of trouble, and even when it feels as if heaven is closed and your words die near the ceiling of your bedroom, and you feel dull and empty, God is there, loving you and eager and willing to hear you, and answer your prayers because of His great love for you. It is at those moments when He is closest, and you are acting the part of a Christian. You don't feel it because there are no nerve endings in the soul. But at the moment we need prayer most, and feel the presence of God least, God is there, listening and answering and loving you because you trust Him and you believe in Jesus, and because you are His child. It is for our comfort that Jesus makes us such promises — something that the world pretends it can also claim, but it is not for them, but only for the Child of God. We hear a lot today about prayer, and its healing powers. Studies purport to show how prayer helps. Doctors are getting into holistic healing and bringing the spiritual into the physical processes of medicine. Those are good developments - but they ignore the Biblical truth that God does not listen to the prayers of those who do not know Him and trust in Him. The experts of the world talk a lot about the "Power of Prayer", but they do not realize that the power is in the One to whom we pray, not in the prayer itself! Without faith it is impossible to please Him, so says the author of the Epistle to the Hebrews, for he who comes to God must believe that He is1 and that He is a rewarder of those who seek Him. So they pretend that it doesn't matter if they actually expect anything from their prayers. They think that the act of prayer simply works for the health of the body and the peace of the mind. And they imagine, falsely, that it doesn't matter to whom you may pray. It is all the same, or so they say with great authority. But they are wrong. Jesus said we are to ask the Father in His name. That means we must know who God is, and we need to know what He has done for us, and such prayer implies that we trust His promises to hear and answer our prayers. That tells us clearly, then which are the only truly effective prayers: the prayers of the Christian. God has made no promise to listen to or answer any other prayer. He hears all other prayers, for the simple reason that He knows everything, but there is no reason from God or His Word to expect Him to answer. The only prayer of the unbeliever that God has promised to hear and answer is the prayer of the unbeliever who is earnestly seeking to find and know the True God. But for those of us who believe, we have God's promise to hear and answer! And we have His invitation to bring all of our troubles to Him. Psalm 50, Call upon Me in the day of trouble, and I will deliver you! And the words of Peter in 1 Peter 5:7, Cast all your cares on Him, for He cares for you. These words are God's invitation to you, along with the words of Jesus in our text, to come to Him in prayer in times of trouble; to call upon Him for strength and endurance in times of fear; to give your worries to God and let them go; to pray for help when you are feeling helpless, and to ask God to help you unwind and relax in times of stress. In every need, you have the gift of prayer, and you can be utterly certain that God the Father listens to you with compassion and concern because He loves you! And we know that love is genuine, because of Jesus, because of the cross, where He died for sins we committed, to take the death that we deserve off of our shoulders; and because of the empty tomb which proclaims that God has accepted the sacrifice of His Son in our place. So, in times of worry, pray. When it doesn't seem that there is any way out of your troubles or even the predicament of the moment, you can pray. When sorrow seems as though it will swallow you alive, you can pray. In every time and in every situation, remember the love of God for you, and the words of Jesus in our Gospel, and, Pray! Therefore, pray. Pray often. Pray with confidence. Never give up on prayer. Take advantage of the love of God for you - because that is precisely what He wants you to do. In the Name of the Father, and of the Son, and of the Holy Ghost. Does Jesus mean what He says? Many will say Jesus is using exaggeration in this section. I believe that is a mistake. He is warning against the penalty of sin as the eternal separation from God. It is more desirable to mutilate oneself if that were to stop sin and be maimed in the relatively few years one will live on earth rather than to languish for all eternity in hell. Eternal damnation is that horrible that life without eye, hand or foot is less torture. No to look at other sermons of Jesus we see that teaching is not an exaggeration at all. What is not possible is to stop sinning. If one were to have all hands, feet, eyes, tongue and hearing removed he or she would still fall short of the glory of God. So we see here one would have to tear out his or her fallen humanity to stop from sinning. Our flesh is always sinning even in the best of circumstances. This is why we need Jesus’ righteousness in which to be clothed rather than our own. It is completely impossible to control thoughts and feelings each and every moment of life. These violate the perfect commands of God just as much in His sight as acting on them in the sight of others. This further shows the folly of those who brag on self improvement rather than pointing to what Jesus has provided. But the worse part of it is that sin is not what separates us from God. What separates us from God is the curse of the law. “In the day you eat thereof you will surely die.” This was spoken to our parents in the Garden of Eden about the forbidden tree. They kept on physical living after disobedience however; they were at that moment separated from God. This separation is passed onto each and every person born. 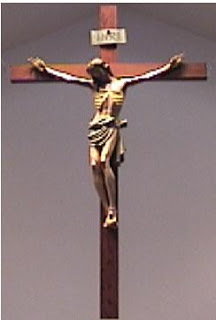 To show the seriousness of this separation we need only consider the cross. God in the person of our Lord took the penalty upon Himself to therefore remove it from us. He suffered this so that we do not have to look for ways to stop sinning. We do as loving children wish to but cannot due to our old nature. No, Jesus did not exaggerate when He taught us about the seriousness of sin and its penalty. He also did not exaggerate on what we receive in the Holy Supper. We receive, as He promised, His True Body and Blood for the forgiveness of sin and strength for faith and life. In the Name of the Father, † the Son and the Holy Spirit. By the way he has some thought provoking mp3 programs here and at coffee cup apologetics. Yes I listen to other folks besides Lutherans. That is one of the sayings of a seminary professor Dr Norman Nagel of Concordia Seminary. He is originally from Great Britain and has a wonderful way of teaching truths from scripture. When speaking with Christians about the subject of sanctification one will find many who will think of it as something that is his or her job. That is what has been taught for years in many Christian churches. It is put forth that God expects, now that you are His child, to have the ability to muscle up against sin and conquer it with His help. In addition He expects you to search out ways in which to serve Him in order to get Him more on your side. If a person comes to faith later in life one will see an initial change in behaviour. Old habits which used to be of interest will not longer capture a person’s want. Rather than hours sitting in a tavern getting drunk a person will be satisfied with sitting visiting with family or other Christians. When confronted with lust of the flesh revulsion will strike that person rather than hours of feeding the thought and perhaps sharing this with others. These and many others will appear to be the choice of the believer and he or she will be understandably happy and rejoice in it. St Paul puts it out there that all those things we have a change in our minds about and the good deeds we want now to do is actually God doing them. However, why should it be done with fear and trembling? Due to the fact that a Christian is indeed a saint he or she remains a sinner. The mixed motivation of self interest is contained in everything he or she does or refuses to do. This self motivation falls short of the glory of God who gives gifts and care totally out of love for the person receiving the gift. It is impossible to accomplish that as a finite person in a sinful body and world. Each and everything is laced with fear of punishment or hope or reward. Jesus when on earth did His work totally for our good out of love for us. Nothing was in it for Him other than the joy of fulfilling the law for us and suffering, dying and rising again for our salvation and sanctification. We cannot fathom how that suffering could contain any joy for Him especially doing it for those who by nature are His enemies and to this day spit at him with our sin. Amazing! Receivers of mercy are what Christians are. A chosen group of people describes the holy Christian church. We are royal priests unto our God who speak to God on the behalf of people and speak to people on the behalf of God. This is pretty cool stuff indeed. Out of darkness we have been called and into the light. So it is no surprise we do not fit into the world. We are rejected by those who still walk outwardly in darkness as well as by erring and false brothers. The Chief Cornerstone was rejected as well. The builders despised Jesus when He was making His way to the cross. We have the honor of serving Him who is our foundation and become our cornerstone and we His living stones. But what will happen to the unbeliever and the false and erring brothers? They will stumble over Jesus. The rock of Salvation will grind them to powder Matt 21:44. Now how do we respond to this? What difference should this make in our lives? St Peter had something to say about that. Abstaining from the passions of the flesh does not only have to do with lust of the eyes, flesh and pride of life but in addition reacting to the rejection in hopes of seeking revenge. These passions will war against the soul. This activity will hinder growth in the Christian’s life. In addition God seeks to use us as clay jars to do good deeds in front of the unbeliever so they will see it and glorify God when He comes to them. These actions are what the people who are defined by the mercy of God do. They put away all the reactions which define humans. Indeed are still guilty of them but put them away and do not feed those passions and cause them to grow. This is the response of those who have tasted and know that the Lord is good.